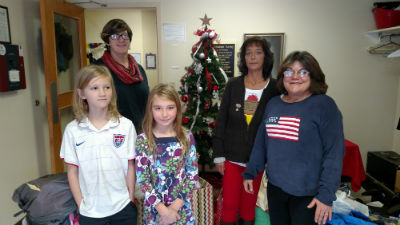 Staunton Montessori School continued the holiday tradition of providing gifts to local families through the Salvation Army’s Angel Tree program again this year. On Monday, students from the schools upper elementary program delivered the gifts on behalf of the whole school to the Waynesboro branch of the Salvation Army. Each classroom created a special tree to hang in the lobby of the school. The trees were creatively filled with tags that students and parents could select, each containing wish list items for the adopted families. Items included toys, clothes, school supplies, shoes and more. Hanging the trees in the lobby of the school not only adds a festive feel, it also reminds the students each day of the importance of giving back to the community. Staunton Montessori School is located in Fishersville and provides Primary (ages 3-6) and Elementary (6-12) and in 2016-17 Adolescent (12-15) Montessori education as a unique alternative for the community. Staunton Montessori School offers AMI trained primary and elementary teachers on staff. The elementary teachers also both have their Masters Degrees in Education.